I will never do business with itch again. It would n't bother that much if you just dumped the game, and said that's it we no longer support our product. But you try and BS me with a phony "Steam Key" charade, when it's so obvious that Steam is NOT involved with itch or Aven Colony. When I point this out you ban me, it's just plain insulting. Never again. @QuesTMaster good luck, you are dealing with people who don't understand that they should first contact Steam before they tell people to go there and use a "key" for this stupid game. They put up on there site "go to steam we are not supporting are own unfinished game anymore" yet Steam knows nothing about this. What kind of idiot does this. Or worse human garbage. I believe it was "Windows6.1-KB3172605-x64.msu" or "Windows6.1-KB3048761=x64.msu" I don't remember which one it was, think it's the first one. Let me know if it works I have a third file that might be it also. Aven Colony community · Created a new topic Keyboard shortcuts? Is there a list of Keyboard shortcuts? There was one to center the window on a saved point, this is a must, if the mouse pointer goes anywhere near the edge of the window it's game over. The game is unplayable without being able to center the view back to somewhere usefull. In the Colony Control Panel, click the Policies tab, and check the box for Immigration Ban. No one will come as long as that is checked. Sandbox mode was never enabled. Sandbox works though it's not enabled in the itch app. Updated to 0.1.14014 using the itch app (had to no other way) and the itch app now launches the game. Will wonders never cease, very nice. Aven Colony community · Replied to dorukasama in HOW TO ADD GAME TO ITCH APP? Try running the game without the launcher. When I try to start the game with the itch launcher I get the same thing, it's a different number but the same basic error. Try running the game from the AvenColony.exe file. For me it's located at C:\Aven Colony\aven-colony-windows-beta. Then look for the file, I am not sure if Windows hides exe files by default or not you might have to change that setting if you can't see it. It should be the first file after 2 folders. Double click it and see if the game starts. That's the way mine runs, i just made a shortcut to it on my desktop. I get the same thing. The itch app just crashes so that is not an option. I have 0.1.13413, but will need to update in the future. Are you trying to run it with the itch launcher, or right from the exe file? If you are using the launcher, try running the game using the Avencolony.exe file. It worked for me. Aven Colony community · Posted in HOW TO ADD GAME TO ITCH APP? @dorukasma, I had trouble running the game after reinstalling Win7. I also had downloaded and run the zip file and did the roaming file thing. Trying to run the game with the itch front end didn't work for me, still doesn't, just generates an error message and wants me to sign up to get another web site. My advice is find some other way. I got my game working buy updating Windows, (there 96 updates one of them was the one Aven needed). To this day the itch is worthless, all it does is crash and want you to sign up to different web sites. It's more adware than anything else. Try running Windows update and see if that works. I would avoid the so called "launcher." Yeah, I love hearing elections are coming up that first time. It means I can put the drones to auto repair. I have played all the scenarios and was wondering which one would be the best one to play in sandbox mode? Anybody have any suggsestions? Aven Colony community · Posted in Captions? Captions is a great idea. @ pratticus26 that's exactly what was happening to me. It ended up being different updates that weren't installed. It took a couple of days searching the internet to get the right updates. The first one, I had to let run for over 12 hrs. That one, was the fix for my update problem. After that I was able to download a ton of updates, one of them worked, I don't know which one. That is one of pet peeves about tech, "say what you mean." Don't run some BS message that is totally unrelated to the problem. There is a web site I will never use, because I tried accessing my account with my phone, and kept getting a "incorrect password" message. The fact was that Yahoo was never going to let me access the site from a mobile device (morons, that's why they will go out of business). Instead saying F You, your never going log in for a phone, they say "wrong password" WTF. Anyway it's probably not about Microsoft Visual C ++, just like my problem wasn't. Say what you mean!! Don't BS me. itch.io Community » itch.io » Questions, Ideas & Feedback · Created a new topic Windows not updating? This for anyone having a problem with Windows not updating. Ok, In another thread I was having problems because Windows 7 wouldn't update. It just kept running the update, but not really doing anything. I Googled it, and this is a known problem. In July Microsoft put out a fix that could screw up your computer and not let boot up. I was faced with never updating a newly installed Windows 7, or taking the chance. I took the chance. It took over 12 hours to install the fix, I just let it "run" and left the computer on. When it finally installed I was able to down load and install all the updates, 98 of them. I am glad I stuck with it, read that you needed to let the fix run for 8-12 hrs when I downloaded the file. If anyone else is having this problem, download the fix and wait it out however long it takes to install. I thought it would never work, but it finally did install and solve the update problem. Update: I took the chance and installed the fix, which took over 12 hrs to install (read that you should just leave your computer on and let it run for however long it takes to install). 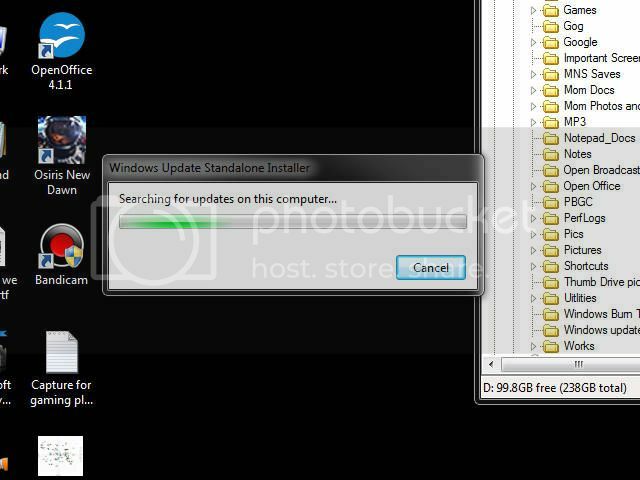 After that I was able to install 98 updates to Windows 7, so i am a happy camper now. Thanks Sysop-Delco for trying to help, it meant a lot while i was going though all this. That's a big part of the problem, I did download the update and manually install it. That is the picture I posted of the manual install, just spinning it's wheels forever "searching for updates on this computer". What? I thought that was the update. What it does is put some zipped files on my C drive. I guess those are the ones it's looking for. How stupid is that, puts files on my computer then can't find them. At this point my computer is not able to update period. End of story. The game will never work, the computer will never update. That's just the way it is. I googled it and this is a known problem. The "Fix" makes your computer unable to boot. So my choice is, 1) Keep the status quo and never update, or 2) turn my computer into a brick. Which one do think I will pick. Yeah, looks like they are having the same problem. Even the part about windows update not updating. Looked like most of them just got a refund, and never solved it. My updates are 1 for "silverlight", 1 for MSE (which is just an ad for Windows 10), 2 for my sound card, and 1 for displaying multiple windows. The last one is only one that has anything remotely involved with the situation. I'll try downloading it and installing it manually. Thanks for your reponse. Ok, their is no updating Windows it just does the same thing as the regular update program. When I try to install it just endlessly "searches" for updates, which what I was supposed to have downloaded with the file I ran. So their is no updating. OMG, I tried both the app, and installing it by hand. As for error messages it saying I needed "Microsoft Visual C++ 2015" which it installed but refused to recognize it's own work. I checked and it's installed. So where it stands is I have Microsoft Visual C++ 2015, Aven Colony insist I don't, and refuses to run. The "app" supposedly "installed" the game, but it's the same story, it can't find Microsoft Visual C++ 2015. Not much I can do if the software can't deal with reality. Why did I format my disk? Answer: Microsoft Windows operating system, needs to be nuked on a regular basis. Aven Colony refuses to acknowledge that this IS installed. I got the beta about a week ago, decided to try bordered windowed mode a few days ago. When the mouse curser touches the inner edge of the window (when clicking on announcement's for example) the game POV will move all the way to the upper left hand corner. Happens every time so it's easy to reproduce. It does not happen in borderless windowed mode Other than that it's running and playing pretty well. Ok thought this was the Aven Colony forum, thanks. I got the beta a couple of days ago, decided to try windowed mode today. When the mouse curser touches the inner edge of the window (when clicking on announcement's for example) the game POV will move all the way to the upper left hand corner. Happens every time so it's easy to reproduce. Other than that it's running and playing pretty well.